Retirement as we know it is a fairly new concept, and one that grew out of necessity as people began to live longer. Today, the average life expectancy is about 78 years; in 1900, it was just 49. The idea of pensions, a regular payment made to a retiree out of a fund the retiree and/or employer contributed to during his or her working life, has been around since the 13th century BC, when Roman soldiers were paid a pension for their service. Modern pension plans have only existed since 1875 in the United States, when the American Express Company began offering workers an employer-provided pension plan. Social Security is less than a century old, having been enacted in 1935. Both corporate pensions and Social Security, whose benefits start at age 65, were created with the expectation that workers would live a decade or so in retirement. While an exact number of retirees in the United States is difficult to determine, there are some 42 million people age 65 or older currently receiving Social Security benefits, a good indication of the number of retirement-age people in the U.S. However, not all of these retirement-age people are able to retire. 7.2 million Americans age 65 and older are working – double the number from 15 years ago. Why are so many more Americans choosing not to retire, or are re-entering the workforce? The old saying that “it’s never too early to start saving for retirement” is completely true. The sooner you can start saving for retirement, the better, and if starting early enough, it only takes a small percentage out of every paycheck to make retirement possible. Ideally, the average worker would start saving for retirement as soon as they started earning paychecks because of compound interest. Savings funds that earn interest continue to grow more and more over time, even if you stop contributing to the fund. Take this example from CNN Money. Though the worker has saved $60,000 more for the fund, in the end, the fund is worth over $100,000 less. That 10-year head start pays huge dividends. Of course, not everyone starts saving for retirement at 25. If you’re playing catch up on retirement saving, read our advice on what to do if you’re starting the process late. You already know that the earlier you start saving, the better. But how much should you be saving? In general, it is suggested that workers save 10-15% of net income for retirement. When will your pension or other retirement plans begin paying out? 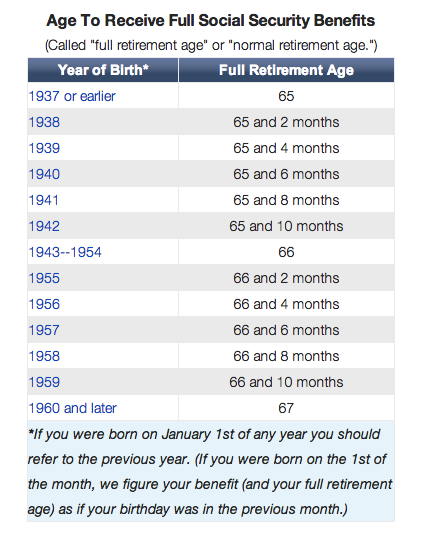 When will you be eligible for Social Security benefits? When will you reach full retirement age? When will you be eligible for Medicare and/or Medicaid? Do you know where you’d like to live when you retire? In general, the closer a person is to retirement, the less risky they will want their investment portfolios to be. Conversely, the farther from retirement an investor is, the more risk they should consider, as there is greater chance for growth over time. Determine your own risk tolerance before planning your retirement investment strategy. One common retirement investing principle is the Rule of 100. – To determine what percentage of your portfolio should be in equities (such as stocks) and what percentage should be in fixed income securities (bonds), subtract your age from 100. An Individual Retirement Account (also known as an Individual Retirement Arrangement), or IRA, is a savings account for retirement. You can take money out of an IRA at any time, even if you have not reached the age 59-½ threshold. However, there may be a penalty for withdrawing early from an IRA. – If you are 59 ½ or older, there is no penalty for withdrawing early from an IRA. A pension is a retirement plan set up by employers for employees. A cash balance plan is a kind of pension plan set up by employers for employees. Annuities are an investment that pays out a steady income in the future. These payments can occur for a few years or for an investor’s lifetime. Annuities are an investment that can be made within common retirement accounts including IRAs and 401(k) plans. – 401(k): A 401(k) for a self-employed worker is often called a one-participant 401(k) or a Solo-401 (k). The United States Social Security program was created in 1935 as a federal social insurance and benefits program. All Social Security taxes collected go to a Social Security Trust Fund. About 57 million Americans receive Social Security benefits today, with nearly one in four households receiving Social Security income. Anyone who was born after 1929 and has worked for at least 10 years is eligible for Social Security benefits. It should be noted that you may choose to delay collecting benefits upon reaching full retirement age (age 65-67, depending on year of birth). Your benefit payments will go up 8% for each additional year after reaching full retirement age that you delay collecting benefits until age 70. The maximum benefit for a worker retiring in 2013 at full retirement age is $2,533 a month; the average payout was $1,264 a month. Q: How do I know how many years I’ve worked and been credited toward Social Security? A: Create a My Social Security account to view your earnings record, estimated taxes paid toward Social Security, and estimated benefits. Q: Can I receive benefits if I’m still working? Q: Would my family still receive benefits if I died? A: Short answer, yes – to varying extents. Learn more about survivor benefits. Q: Can I still withdraw from other retirement plans, like a 401(k), and receive Social Security benefits? A: Yes, and it is highly encouraged to have other retirement resources and savings in place. The average Social Security payout is $1,264 a month – most likely less than you’ll need to cover monthly expenses in retirement. More and more Americans over age 65 are going back to work to cover expenses, receive health care benefits, or just to stay busy.Working during retirement can increase Social Security benefit amounts later because with the added paychecks, you will be contributing more to your Social Security. However, if over age 62, you need to consider any potential cuts to your Social Security benefits before reaching full retirement age and receiving full Social Security benefits at age 66 or 67, depending on year of birth. Health care costs are one of the largest expenses retirees have to plan for. It is estimated that as of 2013 a 65-year old couple retiring will need $220,000 to cover medical expenses through retirement. That number is actually down some $20,000 from the year previous. Thankfully, retirees have some federal insurance programs to help pay for health care costs. All Americans age 65 and over are automatically enrolled in Medicare, the federal health insurance program. Medicare is run by the Social Security Administration and funded through payroll taxes, similar to Social Security. 1.45% of earnings go to the Federal Insurance Contributions Act (FICA), which pays for Medicare, with an employer match (so 2.9% total). Medical care outside of the U.S.
A popular option to help cover these expenses is Medicare supplement insurance, commonly known as Medigap insurance . Medicare does not cover the cost of assisted living, either at a nursing home or with in-home care, and so many people choose to purchase long-term care insurance plans. The average private nursing home room costs $87,000 a year, so long-term insurance is an insurance many retirees choose to carry so as not to deplete their savings or pass those costs on to loved ones. Life insurance is an insurance policy that pays out benefits to your dependents upon your death. Life insurance is more important earlier in life to parents with young families who are still building assets, but may be an important investment for retirees. A reverse mortgage is a home loan that provides the homeowner with regular cash payments based on home equity. In addition to or instead of relocating, many retirees choose to downsize, or move to a smaller residence. Some retirees move from a house to a condo, apartment, or retirement community.